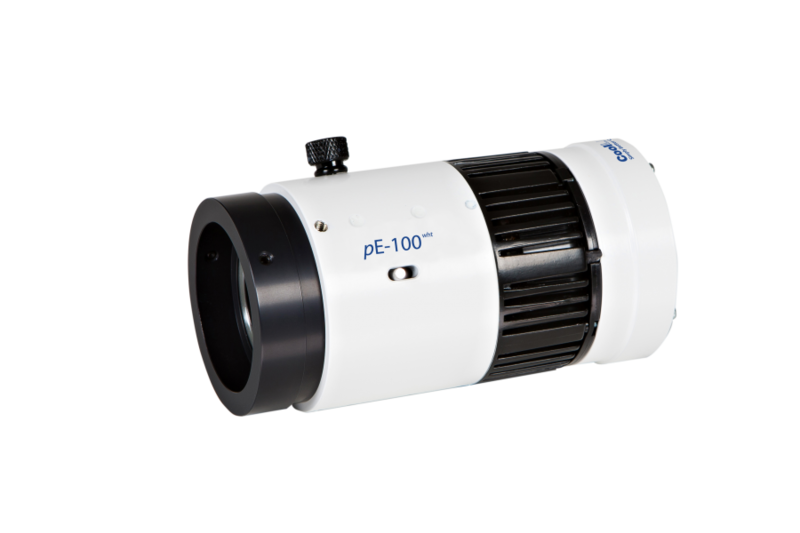 The pE-100wht is a powerful white LED illumination system designed to replace a 100W halogen lamp. Histologists and cytologists who are familiar with results from a conventional halogen lamp can immediately make accurate and reliable diagnosis using the pE-100wht as colours will appear the same. Unlike a Halogen lamp, the colour balance of the pE-100wht illumination system does not vary with intensity, removing the need to make any adjustment. The many additional benefits which LEDs offer – mercury-free, instant on/off, control and repeatability – mean that laboratories using halogen lamps will find that the move to the pE-100wht is obvious and simple.The pE-100wht is a compact and simple-to-use LED illumination system for transmitted light applications and comprises a pE-100wht LED Light Source, control pod, and power supply. The user is given instant on/off and intensity control in 1% steps from the manual control pod which can be positioned close at hand. Remote control is also available via a TTL trigger.